Birkenhead Bridge carries traffic across the Port River at Port Adelaide. Tom 'Diver' Derrick Bridge - Port Adelaide, South Australia, single leaf basule bridge down river from the Birkenhead Bridge. Batemans Bay bridge over Clyde river. Broadwater Bridge, New South Wales, across the Richmond River, New South Wales - built using the renovated bascule span from the demolished Barneys Point Bridge on the Tweed River, New South Wales, converted from counterweight to hydraulic ram lift. Open Boulevard Bridge with the Nijverheid Bridge in the background. Berendrecht Bridge, Antwerp, 68m long span across the Berendrecht Lock at Port of Antwerp. Oudendijk Bridge, Antwerp, 68m long span across the Berendrecht Lock at Port of Antwerp. Zandvliet Bridge, Antwerp, 57m long span across the Zandvliet Lock at Port of Antwerp. Frederik Hendrik Bridge, Antwerp, 57m long span across the Zandvliet Lock at Port of Antwerp. Van Cauwelaert Bridge, Antwerp, 35m long span across the Van Cauwelaert Lock at Port of Antwerp. Kruisschans Bridge, Antwerp, 35m long span across the Van Cauwelaert Lock at Port of Antwerp. Wilmarsdonk Bridge, Antwerp, 35m span at Port of Antwerp. Farnese Bridge, Beveren, across the Kallo Lock at Port of Antwerp. Melsele Bridge, Beveren, across the Kallo Lock at Port of Antwerp. Boulevard Bridge(Willebroek), Willebroek, 57m span. Scheldt Bridge Bornem-Temse, Temse, 50m span. Scheldt Bridge Temse-Bornem, Temse, double bascule bridge, span 50m. Herders Bridge, Bruges, 25.5m span. Dampoort Bridges, Bruges, both spans 20m. Zelzate Bridge, Zelzate, double bascule bridge. Schuitenier Bridge, Leuven, 12m span. Bridges 1 (Lakeshore Road Bridge), 3A (Carlton Street Bridge), 4 (Homer Bridge [Queenston Road]), 6 (Flight Locks Railway Bridge for Canadian National Railways), 19 (Main Street Bridge [Port Colborne]) and 19A (Mellanby Avenue Bridge) on the Welland Canal. Save for Bridges 3A and 19A, all of these were built during the late 1920s as part of the Fourth Canal expansion project (1913-1932). Bridge 3A was built to replace the original Bridge 3, which was destroyed in an accident. Bridge 19A was constructed in the 1980s to alleviate traffic on Bridge 19 (both bridges lie on either end of Lock 8). Bridge 4 is a twin-leaf, Chicago-type bascule bridge, with its counterweights located under the road deck. All the other bascule bridges on the Welland Canal are single-leaf Rall-type bridges, with counterweights suspended on a frame structure over the roadway. Bascule bridge Kidderpore Kolkata (Calcutta)127-year-old. Note that in Dutch basculebrug only refers to bascule bridges that have their counterweight rigidly connected to the bridge deck. If there is a hinged connection, it's referred to as ophaalbrug (literally "drawbridge"). This list lists both. 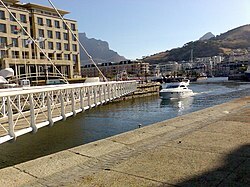 Swing bridge in foreground with bascule bridge in background at Victoria & Alfred Waterfront. Town Bridge, across Weymouth Harbour, Dorset. Lake Pontchartrain Causeway on Lake Pontchartrain in Louisiana. Bruckner Boulevard and Expressway (I-278), Bronx, New York City, New York. (With separate northbound and southbound spans for the boulevard and for I-278, this "bridge" is in reality four double-leaf bascule bridges.). John Ross Bridge (Commonly called Market Street Bridge), Chattanooga, Tennessee. Arlington Memorial Bridge, Virginia – Washington D.C.
^ "NS Savannah River Bridge at Augusta". railga.com. Retrieved 2016-11-20. ^ Dizikes, Cynthia (March 1, 2013). "Crews prepare for intensive surgery on Wells Street Bridge". Chicago Tribune. Retrieved May 26, 2013. ^ Historic American Engineering Record (HAER) No. MA-38, "Congress Street Bascule Bridge"
This page was last edited on 14 April 2019, at 11:08 (UTC).